Hello Namaste, and welcome to another edition of Far East Adventure Travel The Podcast brought to you by Far East Adventure Travel Magazine. Swinging with Gibbons-zip lining in Northern Laos in the habitat of this rare ape species and a visit to Darjeeling, India and the “Toy Train”. To order your subscription simply go to the iTunes App Store, download the app and subscribe. Right now subscribe for two months-get a 7 day trial absolutely free! Go to the App Store now! I think trekking is one of the most rewarding forms of vacation and travel one can do. Especially in the Himalaya regions of India, Tibet, Bhutan, and Nepal. It’s a chance to be completely engaged in an endurance activity, which is great for the body, mind, and spirit. You also have the opportunity to get up close to one the most spectacular mountain ranges in the world. Finally it’s a chance to meet people and be introduced to cultures, that can be very diverse. I’ve had the opportunity to trek in these regions on a few different occasions now and I have only seen a very small portion of trekking routes, villages, and the Himalaya. Everytime I go though it seems I have a completely different experience and that’s why I keep going back. Bhutan is the only area considered Tibetan that I have not traveled to as of yet. It is also one of the most expensive regions in the world to trek as Bhutan limits the amount of travellers it receives every year with a $250 USD mandatory charge per day. An extra $50USD if you are traveling alone. I am told that most of the money goes back into services for it’s citizens including healthcare. You also cannot travel independently in Bhutan. You are always accompanied by a guide. India has some amazing trekking routes. I recently hiked the Singalila Ridge in West Bengal, where you can see the sunrise over 4 of the 5 highest mountains in the world including Kanchenjunga and Mt. Everest. Nepal is my favourite. It of course has some of the best trekking routes, some of them hundreds of years old, great views of the Himalaya, some good teahouses, or guesthouses to stay in on some of the more traveled routes, and absolutely amazing people and cultural diversity. On my recent trek through the Kanchenjunga region of eastern Nepal, one of the most cultural diverse trekking areas, I started out my hike through Hindu villages, eventually as we moved closer to the border of China and India we traveled throughTibetan villages, then later on our way out of the region the indigenous Limbu people and their villages. Having encounters with local people and seeing their way of life will completely remove you from, and make you forget, your own world. So where do you start? Most people that visit Nepal on a trekking adventure want to do the Everest Base Camp route. It’s not surprising and why not? A chance to see the highest mountain in the world while trekking through a valley with other stunning peaks including Ama Dablam, which some people consider more beautiful than Everest. The other popular trek in Nepal is the Annapurna Circuit which has been voted by some publications in the past as the number #1 hike in the world. Both great treks but keep in mind if you go in the busy season, especially October, the trails will be crowded. Many people I have met trekking in this part of the world specifically avoid these routes because of that. One trek that I thoroughly enjoyed hiking in Nepal was the Upper Mustang, a very remote region in Western Nepal that was once called the Kingdom of Lo. It is very Tibetan and not a tough route. It’s slightly more expensive to do because the Nepal government charges $500USD for a 10 day permit. $50 everyday after that. It is not a crowded trail at all and sees at the most approximately 2000 visitors a year, compared to 25,000 in the Khumbu Valley, where Mt. Everest is located. Culturally one of the most interesting treks to do, and very much Tibetan in landscape. It reminded me of very much of Tibet. So if you’re planning or wanting to do a trek in Nepal, especially the two most popular, Everest Base Camp or Annapurna, plan ahead. The spring season, April-May, is less busy than the fall. Never trekked at high altitude before? Give yourself plenty of time to train and get in shape for one of these treks. I always tell people you won’t enjoy it at all if you’re not prepared. Some days you are on your feet for 8 hours. You will not have access to regular showers, maybe a bucket shower and depending on which route you choose you may not have a lot of choice for food at the guesthouses. Get past all of the discomforts, and you will enjoy unforgettable breathtaking scenery, soulful cultural encounters and possibly transform yourself into a life-changing experience. The last trek I did in Nepal was in the Kanchenjunga region where I walked to the north and south base camps of the 3rd highest mountain of the world. It was long, over 21 days almost all with 8 hours or more of hiking each day. It was extremely cold at times, in the extreme high altitude region of the tree line getting to -20 celsius or colder at night. Facilities were lacking. It is still a new region for trekking, especially teahouse trekking and the people of the area still do not have the knowledge to cater to Westerners as far as food and other services go. Was it worth all of the discomfort, the tough tough trekking? No question at all if anyone ever asks me I do not hesitate. It was and everything and more than what I expected. I enjoyed some of the most pristine scenery in the world in one of the remotest places in Nepal and on the planet. I knew that I was in for a challenging experience right from the start of my visit and trek to Kanchenjunga, the 3rd highest mountain in the world. I was only there to trek the region but historically it has been very hazardous and fatal to many mountaineers. Only earlier in the year 5 people died attempting a summit and descent. 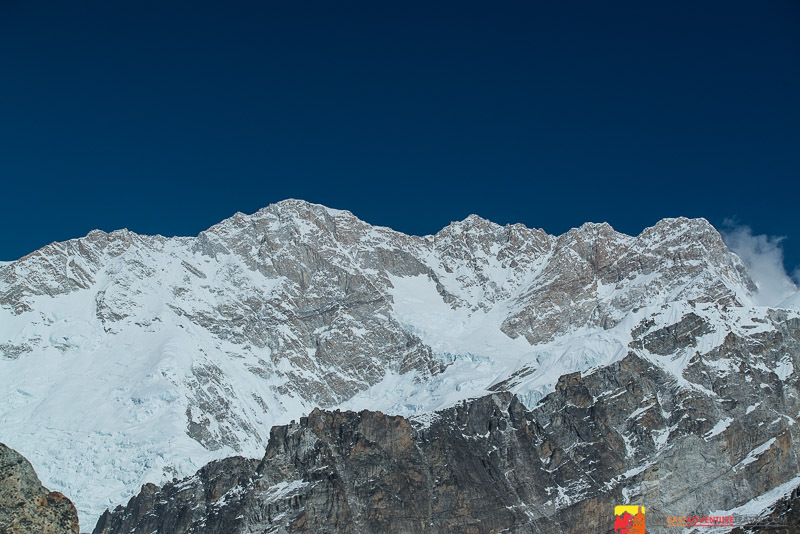 It has been one of the least summited of all of the 8000 meter plus peaks in the Himalaya. We had issues hiring a car to drive us from the airport in Biratnigar to Taplejung, the start of our trek. The drivers were demanding ridiculous fares taking advantage of the Diwali holiday as a way to jack up the prices. Late in the day we finally found a reasonable driver and were off to the start of our 8 hour drive. No time for dinner, just a quick stop at a chai cafe for a couple of samosas. The road was flat and straight at first but as we started climbing it became windy, at times with hairpin turns. I was propped up in the back seat with my duffle bag while Hari my guide chatted in Nepali with our driver. We had only been driving an hour and a half when the sun went down. I can quite easily feel motion sickness but I hadn’t felt this bad since I was a child. Are adults supposed to get car sick? It wasn’t long before I was tapping on our driver’s shoulder to pull over so I could puke. It’s funny now when I think back on it. I was kneeled over on the side of the road. We were quite high now in elevation and I could see the lights below in India. As I starting retching I could hear men singing Diwali songs as they walked past me on the side of the road. Hari gave me some water, “don’t drink it, it’s not good to drink, just use it to wash out your mouth”. Forced humility at the side of the road in the dark in Nepal. Already I was feeling spiritual. We drove for another hour, before I had another bout of car sickness. I sat up front with the driver hoping this would help. It didn’t . I took a motion-sickness pill. This actually made things worse as now I was sleepy and sick to my stomach. We finally arrived at a guesthouse and stopped for the night. I really didn’t have an appetite but I was encouraged by Hari and our driver to come down to the dining hall and have some noodle soup. The nourishment and hot liquid helped. As we were sitting around drinking some tea a group of men came bursting into the hall and started singing and dancing. They appeared to be showing hospitality and were very friendly, entertaining and energetic. They were celebrating Diwali and the tradition of knocking on doors and singing songs for a little donation was their agenda. It immediately lifted my spirits. I thought they were local men from the village where we were staying. They started explaining to me about the tradition and one of the men volunteered that they were actually all Nepali special unit police, in the area to keep the peace for the upcoming elections. They asked me where I was from and were very much engaged and interested in why I liked Nepal so much. They even asked me to get up and dance with them. Something only a couple hours earlier I would have thought impossible given my condition. They just seemed so ordinary, all regular guys. I think that’s what impressed me so much about them. They were showing typical South Asian hospitality, with no heirs, position, or authority. It was at that moment that I knew that any bit of adversity I would endure on this trip would be rewarded with joy that would far exceed any hardship or suffering. Kanchenjunga was welcoming me, and I was ready for an amazing adventure. If you want to see more on Kanchenjunga the third highest mountain in the world visit breezy-size.flywheelsites.com and watch my series of videos on trekking this region. This fall I will finally have the series complete and online for viewing. You can also purchase the April issue of Far East adventure Travel Magazine on the iTunes Newstand. It is packed with stories, pictures and video of my trek through the region. If you have anymore questions about trekking in Nepal feel free to send me an email at john@breezy-size.flywheelsites.com. While you’re visiting breezy-size.flywheelsites.com don’t forget to like us on Facebook and you can also follow me on Twitter and Google+. Far East Adventure Travel The Podcast is brought to you by Far East Adventure Travel Magazine. Go to the iTunes App Store, search Far East Adventure Travel, download the app and now get a 7 day free trial when you subscribe for two months to Far East Adventure Travel Magazine. That’s it for this week’s edition of Far East Adventure Travel The Podcast, thanks so much for listening. Until next time this is John Saboe, safe travels and Namaste!